Shelbyville, Ind. (November 9, 2017) – Knauf Insulation North America (KINA) is simplifying the process of researching and specifying building products that meet today’s most stringent green building rating systems through an innovative partnership with Sustainable Minds (SM). Sustainable Minds is a provider of environmental product transparency applications, data, and services to help product manufacturers design and market greener products. It does so by presenting environmental performance data on building products in an understandable and credible way. By partnering with Sustainable Minds, KINA is simplifying the process of researching and specifying its insulation products for buildings that meet today’s most stringent green building rating systems. KINA is the first insulation manufacturer to use SM Transparency Reports™ and SM Material Health Overviews™ to make it easy for AECs to find environmental & material information in one place. The two organizations have also partnered to launch a new Project Builder / Configurator & Library function within the SM Transparency Catalog. "Having revolutionized the insulation market with the creation of our bio-based and rapidly-renewable ECOSE™ binder, Knauf remains committed to staying at the forefront of sustainable building practices," said Christopher Griffin, CEO, KINA. "We care about what goes into our products and how they are made. We are committed to creating product transparency disclosures for all our products to demonstrate our passion for manufacturing sustainable products that make a difference." KINA has listed 17 of its glass mineral wool insulation products across five CSI MasterFormat® Divisions in the SM Transparency Catalog. The catalog is a cloud-based resource that makes it convenient to navigate product transparency information so architects and specifiers can find sustainable products. It also provides detailed information on how to use these documents to earn credits through programs such as LEED v4, Collaborative for High Performance Schools, Green Globes, the Well Building Standard and the Living Building Challenge. SM Transparency Reports provide not only the technical data required in Environmental Product Declarations (EPDs), but bring that data to life by telling the Knauf sustainability story across the product life cycle. All life cycle data included in the Transparency Reports is third-party verified by NSF International. "Material ingredient and life cycle data can be tough to navigate, especially when trying to align with today’s green building rating systems," said Scott Miller, director of sustainability at KINA. "The partnership with Sustainable Minds simplifies this process—you can find everything about Knauf products in one place." KINA has partnered with Sustainable Minds to make the Transparency Catalog even more user-friendly through the development of a new Project Builder / Configurator & Library. 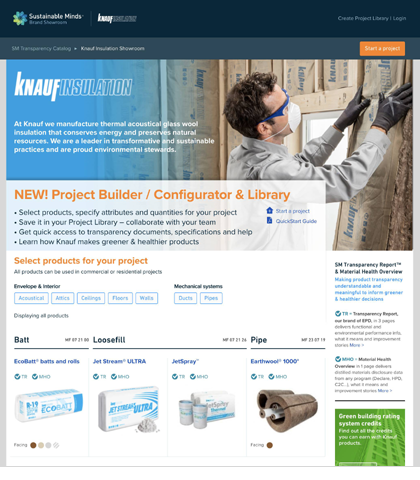 Now, users can create projects in the Knauf Showroom and select, configure and save all the products and their Transparency Reports, Declare labels and Health Product Declarations (HPD) in a project library. This information can then easily be shared with colleagues online or downloaded for distribution. "This forward-thinking initiative showcases what Knauf is doing to improve its products and makes it actionable for building professionals, transforming the way they approach specifying sustainable building products. The amount of information Knauf provides to make the LCA results understandable and meaningful is unparalleled," said Terry Swack, CEO, Sustainable Minds. "Our goal with the Transparency Catalog is to reward those manufacturers who are actually making higher performing, greener and healthier products by getting their products selected and specified. The result is that greener buildings actually get built and everybody and the planet win." Sustainable Minds will host a webinar 2 p.m. ET Thursday, Nov. 16 to provide an in-depth look at the new Project Builder / Configurator & Library. Register at https://attendee.gotowebinar.com/register/1478327854896287233. Visit the KINA Showroom at www.transparencycatalog.com. For more information on Knauf and the company’s commitment to sustainability and product transparency, visit http://www.knaufinsulation.us/en/sustainability. Knauf Insulation North America is a leading, family-owned global manufacturer of thermal and acoustical glass mineral wool insulation for residential, commercial, industrial, OEM and metal building applications. It’s Knauf’s mission to challenge conventional thinking and create innovative solutions that shape the way we live and build in the future, with care for the people who make them, the people who use them and the world we all depend on. In 2009 Knauf Insulation launched ECOSE Technology, a revolutionary formaldehyde-free binder that redefined how the industry viewed insulation, and has continued its commitment to leadership in sustainability by becoming the first glass mineral wool insulation brand to disclose all of its product ingredients through the International Living Future Institute’s Declare list, receiving Red List Free status with several of its products. For more information, visit www.knaufinsulation.us. Sustainable Minds is a B2B cloud provider of environmental product transparency applications, data, and services to help product manufacturers design and market greener products. In 2013, the company introduced its award-winning SM Transparency Report™, an ISO 14025 Type III environmental declaration (EPD) and became a program operator expressly to develop standardized environmental reporting guidance and tools that make product transparency easier, understandable and more effective. Sustainable Minds is dedicated to operationalizing environmental performance in mainstream product development and manufacturing in an understandable, empowering, and credible way. Its easy-to-use standardized solutions make it possible for manufacturers large and small to drive revenue and growth through greener product innovation. For more information, visit www.sustainableminds.com, www.transparencycatalog.com, or www.programoperators.org.